Jan. 24, 2018 – Harris County Department of Education has received three commendations from the Texas Comptroller for its commitment to easy, online access to HCDE financial data. The transparency awards were announced at the HCDE Board of Trustees Public Hearing on Jan. 24 regarding findings of the HCDE Annual Financial Management Report. The recognitions are part of the department’s ongoing efforts to provide open and honest communication with Harris County taxpayers and other community stakeholders through online, financial transparency processes. According to a report from the Texas Comptroller Office, HCDE is one of two of the 1,350 “special districts” throughout the state to earn three fiscal “Transparency Stars” commendation awards. Specifically, the awards from Texas Comptroller Glenn Hegar commend HCDE for transparency in the areas of debt obligation, contracts and procurement, and traditional finances. Those goals are achieved through HCDE’s website on a visually enhanced financial transparency page at www.hcde-texas.org/transparency . The page offers visual and narrative detail on finances, including outstanding debt obligations; spending and revenue information; and accountability and transparency for contracting activities. The Texas Comptroller Office launched its program called “Transparency Stars” in March 2016 to recognize cities, counties, school districts and special-purpose districts which make important strides toward greater government transparency. After achieving a base level of transparency, districts can apply to gain accreditation for five additional areas. HCDE achieved all of those applicable transparency categories. Also Wednesday, Whitley Penn shared the results of the 2016-2017 Annual Financial Audit of HCDE. The department received the highest possible rating of “unmodified opinion” of HCDE’s financial statements. For more information about HCDE’s financial management, visit www.hcde-texas.org/transparency . 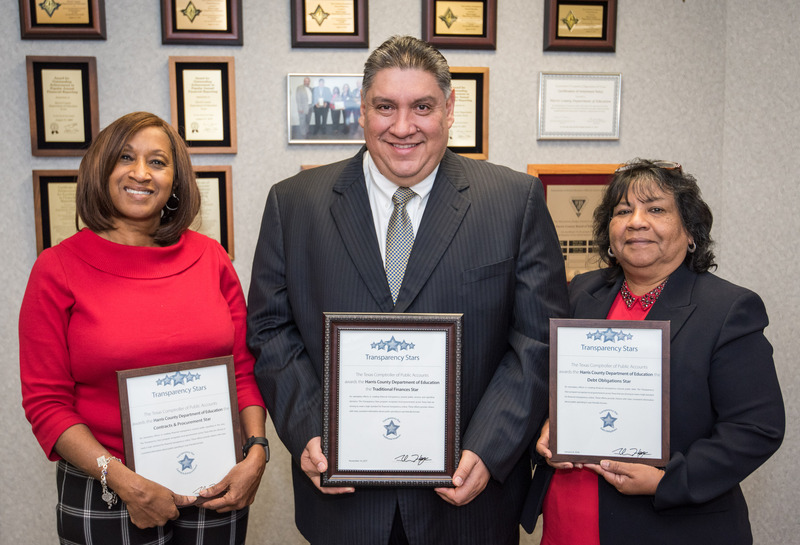 Photo: (left) Harris County Department of Education Purchasing Assistant Director Kendra Jackson; HCDE Assistant Superintendent for Business Services Jesus Amezcua; and HCDE Business Services Chief Accounting Officer Rosa Maria Torres display three transparency awards from the Texas Comptroller Office. HCDE continues to prioritize its ongoing efforts to provide open and honest communication with Harris County taxpayers and other community stakeholders through online, financial transparency processes.